Yalda, a Syric word imported into the Persian language by the Syric Christians means birth (tavalud and melaad are from the same origin). It is a relatively recent arrival and it is refereed to the "Shab e Cheleh Festival" a celebration of Winter Solstice on December 21st. Forty days before the next major Persian festival "Jashn e Sadeh" this night has been celebrated in countless cultures for thousands of years. The ancient Roman festivals of Saturnalia (God of Agriculture, Saturn) and Sol Invicta (Sun God) are amongst the best known in the Western world. Fires would be burnt all night to ensure the defeat of the forces of Ahriman. There would be feasts, acts of charity and a number of deities were honored and prayers performed to ensure the total victory of sun that was essential for the protection of winter crops. There would be prayers to Mithra (Mehr) and feasts in his honor, since Mithra is the Eyzad responsible for protecting "the light of the early morning" known as "Havangah" It was also assumed that Ahura Mazda would grant people's wishes, specially those with no offspring had the hope to be blessed with children if performed all rites on this occasion. Another related Roman festival celebrated at the same time was dedicated to Sol Invictus ("the invincible sun" Originally a Syrian deity, this cult was imported by Emperor Heliogabalus into Rome and Sol was made god of the state. With the spread of Christianity, Christmas celebration became the most important Christian festival. In the third century various dates, from December to April, were celebrated by Christians as Christmas. January 6 was the most favored day because it was thought to be Jesus' Baptismal day (in the Greek Orthodox Church this continues to be the day to celebrate Christmas). In year 350, December 25 was adopted in Rome and gradually almost the entire Christian Church agreed to that date, which coincided, with Winter Solstice and the festivals, Sol Invicta and Saturnalia. Many of the rituals and traditions of the pagan festivals were incorporated into the Christmas celebration and are still observed today. 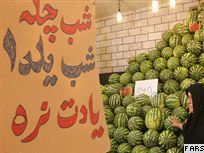 It is not clear when and how the world "Yalda" entered the Persian language. The massive persecution of the early Christians in Rome brought many Christian refugees into the Sassanin Empire and it is very likely that these Christians introduced and popularized "Yalda" in Iran. Gradually "Shab e Yalda" and "Shab e Cheleh" became synonymous and the two are used interchangeably. The Iranian Jews, who are amongst the oldest inhabitants of the country, in addition to "Shab e Cheleh" also celebrate the festival of "Illanout" (tree festival) at around the same time. Their celebration of Illanout is very similar to Shab e Cheleh celebration. Candles are lit; all varieties of dried and fresh winter fruits will have to be present. Special meals are prepared and prayers are performed. There are also very similar festivals in many parts of Southern Russia that are identical to "Shab e Cheleh" festival with local variations. Sweet breads are baked in shape of humans and animals. Bon fires are made; dances are performed that resemble crop harvesting. Comparison and detailed studies of all these celebrations no doubt will shed more light on the forgotten aspects of this wonderful and ancient festival, where merriment was the main theme of the festival. Happy Shab e Cheleh. - Courtesy of Massoume Price. ايرانيان سی ام آذر ماه با جشنی شبانه با آخرين روز پاييز وداع می گويند ؛ جشنی که از آن به عنوان جشن شب چله يا شب يلدا نام برده می شود. اين جشن نمادين که همراه با گردهمايی خانواده ها برگزار می شود، باقی مانده جشن های شبانه ای است که ايرانيان در سده های گذشتهبرگزار می کردند و از آن جشن های رنگارنگ جز ردپايی بجا نمانده است. شب چله برای ايرانيان شب تولد ميترا خداوندگار روشنايی است. آنها طولانی ترين شب سال را با گفت و شنود و خوردن آجيل و ميوه های سرخ فام به اميد پيروزی روشنی بر تاريکی سپری می کنند. گفته می شود مراسم شب چله يا تولد ميترا که از آئين ميترائيسم برجای مانده، در زمان جنگ ايرانيان با يونانيان به آن کشور رفت و از آن طريق به روم رسيد و از آن پس اروپائيان آن را به عنوان شب تولد عيسی مسيح قرار دادند. 'Shab-e Yalda', celebrated on 21 December, has great significance in the Iranian calendar. It is the eve of the birth of Mithra, the Sun God, who symbolised light, goodness and strength on earth. Shab-e Yalda is a time of joy. Yalda is a Syriac word meaning birth. Mithra-worshippers used the term 'yalda' specifically with reference to the birth of Mithra. As the longest night of the year, the Eve of Yalda (Shab-e Yalda) is also a turning point, after which the days grow longer. In ancient times it symbolised the triumph of the Sun God over the powers of darkness. The Cult of the Sun was first introduced to Iran thousands of years ago by migrant Aryans. Mithra, the Sun God remained a potent symbol of worship throughout the following centuries. Centuries later, during the Achaemenid era, Mithra became a principal deity, equal in rank to Ahura Mazda (the god of all goodness) and Anahita (goddess of water and fertility). In Sasanian times, Zoroastrianism became Iran's official religion, but Mithra's importance remained undiminished. This is evident from the bas-reliefs as Naqsh-e Rustam and Tagh-e Bustan. At Naqsh-e Rustam, Anahita bestows the royal diadem upon Nasri, the Sasanian King. At the investiture of Ardeshir I, Ahura Mazda bestows this diadem to the new King. At Tagh-e Bustan too, Ahura Mazda is again conferring the royal diadem upon Ardeshir II. Mithra is always present as a witness to these ceremonies. Over the centuries Mithraism spread to Greece and Ancient Rome via Asia Minor, gaining popularity within the ranks of the Roman army. In the 4th century AD as a result of errors made in calculating leap years and dates, the birthday of Mithra was transferred to 25 December. Until then Christ's birthday had been celebrated on 6 January by all branches of the Christian Church. But with the cult of Mithra still popular in Roman Europe, the Christian Church adopted many of the Mithraic rituals and proclaimed 25 December as the official birthday of Christ. Today the Armenian and Eastern Orthodox Churches continue to celebrate 6 January as Christ's birthday. It was said that Mithra was born out of the light that came from within the Alborz mountains. Ancient Iranians would gather in caves along the mountain range throughout the night to witness this miracle together at dawn. They were known as 'Yar-e Ghar' (Cave Mates). In Iran today, despite of the advent of Islam and Muslim rituals, Shab-e Yalda is still celebrated widely. It is a time when friends and family gather together to eat, drink and read poetry (especially Hafiz) until well after midnight. Fruits and nuts are eaten and pomegranates and watermelons are particularly significant. The red colour in these fruits symbolises the crimson hues of dawn and glow of life, invoking the splendour of Mithra. Because Shab-e Yalda is the longest and darkest night, it has come to symbolise many things in Persian poetry; separation from a loved one, loneliness and waiting. After Shab-e Yalda a transformation takes place - the waiting is over, light shines and goodness prevails. The winter solstice, December 21st or 22nd, is the longest night of the year. For example, this year, on 21st December London (England) will see only seven hours and 49 minutes of daylight. Near the winter solstice, the length of the day changes very slowly, as does the Sun's height in the sky - one of the reasons why the long winter nights seem to go on forever! In Iran, the winter solstice has been celebrated for centuries and it is called Shab-e yalda, which refers to the birthday or rebirth of the sun. Yalda is a Syriac word and means birth (tavalod and meelaad are from the same origin). The ceremony is traced to the primal concept of Light and Good against Darkness and Evil in the ancient Iranian religion. This night with Evil at its zenith is considered unlucky. The last day of the Persian month of 'Azar' is the longest night of the year. From this day forward, Light triumphs as the days grow longer and give more light. This celebration comes in the Persian month of 'Day', which was also the name of the pre-Zoroastrian creator god (deity). Later he became known as the God of creation and Light, from which we have the English word day (the period of light in 24 hours). The Persians adopted their annual renewal festival from the Babylonians and incorporated it into the rituals of their own Zoroastrian religion. The occasion was celebrated in the festival of 'Daygan' dedicated to Ahura Mazda, the Lord of Wisdom. Fires would be burnt all night to ensure the defeat of the forces of Ahriman (principle Evil). There would be feasts, acts of charity and a number of deities honoured and prayers performed to ensure the total victory of the sun that was essential for the protection of winter crops. There would be prayers to Mithra (Mehr) and feasts in his honour, since Mithra is the Eyzad (deity) responsible for protecting " the early morning light", known as 'Havangah'. It was also assumed that Ahura Mazda would grant people's wishes. In the evening of Shab-e Yalda bonfires are lit outside, while inside the home, family and friends gather in a night-long vigil around the korsi, a low, square table covered with a thick cloth overhanging on all sides. A brazier with hot coals is placed under the table. In the past, fruit and vegetables were only available in season and the host, usually the oldest in the family, would have carefully saved grapes, honeydew melons, watermelons, pears, oranges, tangerines, apples, and cucumbers. These were then enjoyed by everyone gathered around the korsi, or a fireplace.